During the months of November through April, Turtle Lake Resort is offering a Weekend Getaway Package. Arrive on Friday, stay in our Suites or Palms rental units (your choice depending on availability) Friday and Saturday nights and depart on Sunday with great memories of a wonderful and romantic weekend at Turtle Lake Resort. This is a perfect package for couples! 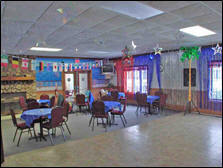 Use our indoor heated pool or our indoor hot tub, need to dry out; there's lots more to do in the main Clubhouse area. If we have a Comedy Night scheduled, you may attend the comedy show and the Party afterwards by purchasing Comedy Show tickets Our Weekend Getaway Special is priced at only $160/couple for a 3 day, 2 night stay! Our Weekend Winter Getaway is available from November thru April (certain Special Event Weekends are excluded from this offer). Call the Resort Office at (517) 741-7004 for more information or to reserve your Weekend Getaway.